Each reaching up to 5 inches across and in an exquisite, deeply-veined white! Very hardy and incredibly easy to care for too. Perfect either in a large pot or garden border, it will flower all summer long from around June. 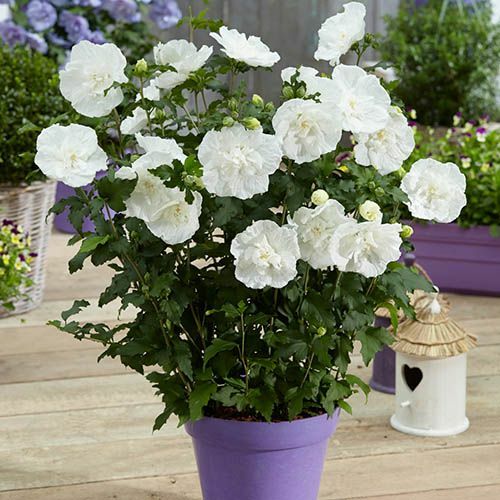 This brand new ‘Chiffon’ Patio Hibiscus will produce an abundance of massive, multi-layered blooms – each reaching up to 5 inches across and in an exquisite, deeply-veined white! Despite its exotic looks, it is very hardy and incredibly easy to care for too. Perfect either in a large pot or garden border, it will flower all summer long from around June. This colour is a new release for 2018 and in very short supply – get yours now before they’re gone! Height 1.5m or prune to size. Prune plants back hard in late spring to encourage a bushier shape. Hibiscus Syriacus 'White Chiffon' prefers a moist, well-draining soil in full sun. Before planting, incorporate plenty of well-rotted manure into the planting hole. Once established, pruning is minimal and only if necessary.